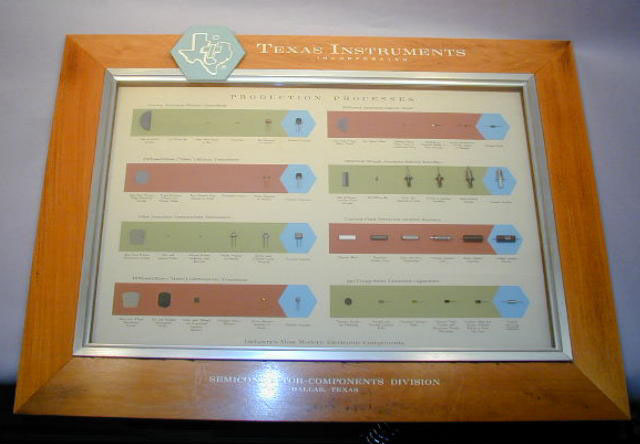 This display was made in 1959 to show the principal process steps in making typical TI components of the period. The following products are shown: Silicon grown junction transistors; Silicon diffused base mesa transistors; Germanium alloy junction transistors; Germanium diffused base mesa transistors; Silicon diffused junction diodes; Silicon 1500V single junction rectifiers; Carbon film precision resistors; Solid tantalum capacitors. Related material in collection: 1987.0487.362(Identical display).